2013 was billed as a banner offensive tackle class. Eric Fisher was the talk of the town after his performance at the Senior Bowl left scouts drooling over what the 6-7 Central Michigan tackle could potentially become. He’d eventually go number one overall, with Texas A&M tackle Luke Joeckel going number two, Oklahoma tackle Lane Johnson going number four, Alabama tackle D.J. Fluker going number 11, and Syracuse tackle Justin Pugh going 19. Putting any of those five guys in the same conversation as David Bakhtiari pre-draft would have been laughable. The sub-300 pound offensive tackle with an awkward kick-slide couldn’t possibly have the ‘upside’ of a behemoth like Fluker who dominated SEC competition. That was the perception. The fact of the matter is, if the 2013 draft were to be done all over again, knowing what we know now, Bakhtiari would go first overall. The Packers left tackle has earned a pass-blocking grade over 85.0 in every season after his rookie year. His 96.4 pass-blocking grade since the start of 2016 is so far and away the tops in the NFL that it’s almost difficult to believe. Joe Thomas was the gold standard in pass-protection throughout his career and has the second-highest grade behind Bakhtiari among tackles over that span with a 92.4 overall grade. They’ve given up the same amount of pressures (49), but Bakhtiari did it on 582 more pass-blocking snaps (1,612 vs. 1,030). 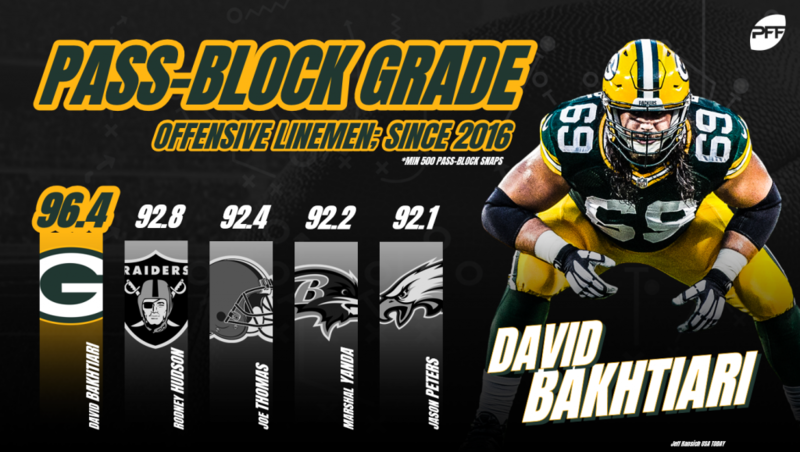 Unsurprisingly, Bakhtiari once again has the top pass-blocking grade in the NFL this season (92.3). Which begs the question; how did everyone and their mother pass on the best pass-protecting left tackle in the NFL? Even the Packers themselves chose to select defensive end Datone Jones and running back Eddie Lacy earlier than the long-haired tackle out of Colorado. The answer to that question has a lot to do with the position itself. While superior size, strength, and athleticism can make pass-protection easier, it’s not the be-all and end-all. Taking a pass-set is a very unnatural act. Rarely in any sport does someone have to play exclusively going backward. It is as much a learned skill as almost anything in the game of football. Natural ability will only take you so far. Bakhtiari has simply perfected his style of pass-protection, and improved enough physically since entering the league to execute it. There’s not necessarily a ‘correct’ way to take a pass-set, but there are some core tenets. By far the biggest is maintaining the proper relationship between defender and quarterback. The tackle’s rear end should never stray too far off from pointing at the quarterbacks drop spot. Watching the angles of Bakhtiari’s pass sets is a thing of beauty. He gains so much depth off the snap, and most importantly, never stops his feet. Look at his feet in the play below as he continually adjusts his positioning to Jerry Hughes’ movements before sending him deep past the quarterback. While brute strength along the offensive line can lead to some dominant reps, agility is a far more desirable trait to mirror defenders in pass protection. Bakhtiari’s 4.74 short shuttle and 7.70 3-cone at the combine were both above average for the position, and it shows up on the field. Watch how quickly he transitions from gaining depth in his pass set to passing off the stunt. The next biggest tenet of pass-protection is the punch, and this is where Bakhtiari is unique. Many tackles want to attack defensive ends and will overextend themselves trying to land the first punch. Bakhtiari, on the other hand, almost never gives his hands to a defender until they’ve made the first move. His patience is second to none. Once the defender has shown his hand, Bakhtiari fires into their shoulder pads. Labeling what he does as a punch is a misnomer. A more accurate term would be a latch. Bakhtiari has the best hands in pass-protection of any tackle in the league, he doesn’t miss when he goes for a defenders shoulder pads, and once he’s in your pads, it’s over. The reps above are nearly identical. Both defenders go for the long arm, and Bakhtiari immediately renders that arm moot with his hand placement. It takes a tackle who’s confident in his anchor to leave his own shoulder pads that wide open though, as it makes you very susceptible to the bull-rush. However, Bakhtiari is fantastic at sinking his hips and getting his hands underneath the defender’s to re-establish leverage, as you can see below. This has been by far the biggest change in Bakhtiari’s game since coming into the league. He showed up at the combine back in 2013 weighing 299 pounds. Now he’s listed at 310. His first year in the NFL, his play strength was an enormous issue, but with each passing year, it has improved. The thing is, he was a 21-year-old hailing from a college program in Colorado that went 1-11 during his final year there. He wasn’t close to a finished product technically or physically. My biggest takeaway looking back on his NFL.com draft profile is that Bakhtiari called himself a ‘gym rat.’ That’s proven to be true, as he’s completely overhauled his body and skillset over his five NFL seasons. Here he is, in his first game as a rookie, lunging at Aldon Smith and giving up a sack because of it. Here he is getting completely overpowered by Ziggy Ansah that same year. Now? Bakhtiari has allowed three total pressures in his last three outings against the Lions and has proven to be one of the best fourth-round picks of all-time.